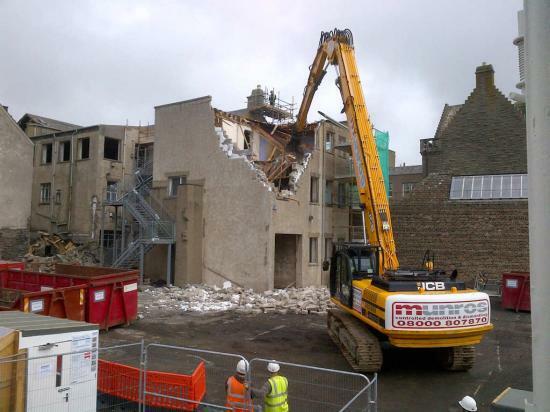 Work got under way on Friday 10th May 2013 on the demolition of The Highland Council�s Caithness HQ at Market Place, Wick in readiness for an �8 million redevelopment of the town centre site as modern Council office accommodation. The Council has awarded a contract to Morgan Sindall to carry out the redevelopment of Market Place. Their sub-contractors, Munros have removed windows and fittings in recent weeks and began the demolition of the building in earnest today. The new building, together with a refurbished Stafford Place Buildings, will accommodate 140 Council staff currently based in a number of offices in Wick. The new building will be built on three floors to the front and two floors at the rear. When the new Council offices open, staff presently based at High Street (Social Work) and Rhind House (Education Culture and Sport) will move there. The project is due for completion early in 2015. Eighty staff, including those at Wick Service Point, have relocated to Government Buildings, Girnigoe Street while the new offices are built at Market Place.